The RP-Sanjiv Goenka Group and the Virat Kohli Foundation have joined hands for the 2nd edition of the Indian Sports Honours. This annual ceremony is an effort to reiterate the spirit of sportsmanship in India and offer appreciation and grace to the exceptional performances of Indian sportspersons. The second edition of the ISH will be held on Saturday, 16th February 2019 in Mumbai. The members of the jury came together in Kolkata to select the winners which were nominated in every category. The nominations were shortlisted by Sports Journalist Federation of India (SJFI) and voted on by over 200 journalists to select the final nominees. The entire selection and jury process is overseen and validated by EY as Process Advisors to the ISH. Gracing the event were Mr Sanjiv Goenka, Chairman, RP-Sanjiv Goenka Group and Chairman of the jury, Mr Pullela Gopichand, Chief National Coach for the Indian Badminton team and former All–England Champion. 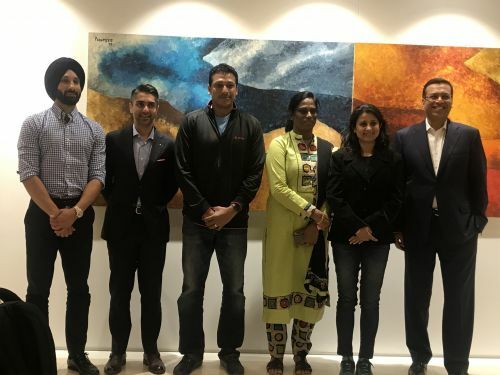 Also present were the new jury members, 2008 Olympic Gold Medalist Abhinav Bindra, and former Indian Hockey Captain Sardar Singh alongside existing eminent jury members multi-Grand Slam winner Mahesh Bhupathi, legendary athlete PT Usha, and former world number one shooter Anjali Bhagwat. In accordance with the sports enthusiasm in India, Indian Sports Honours observes the support of the Indian sports fraternity in its entirety. The ceremony witnesses the congregation of the complete Indian Sports universe ranging from Indian sports legends to sports journalists to sports enthusiasts, all of whom unite to honour the hard work and skills of the athletes. Mr. Abhinav Bindra, Olympic Gold Medallist, said, “The award an athlete gets is just not for that individual but it also recognises the team and support staff which is committed for the athlete’s success, the award is just not a reflection of an individual’s success but it reflects his/her team’s efforts too.